The irony of Russellville’s history isn’t lost on its police chief Victor Shifflett. Jokes aside, Russellville, a city of 7,000 residents located 25 miles west of Bowling Green, is home to several factories. Consequently, many people commute to and from the city for work. Because of that, RPD has seen an uptick in traffic-related calls in recent years. However, that is nothing compared to the Aug. 21, 2017, traffic Russellville experienced during the solar eclipse, Shifflett said with a reflective grin. Facing challenges is part of the game, Shifflett said. The challenges RPD faces are not dissimilar to what other agencies across the state encounter. Besides traffic, those challenges include drugs, theft and the like. Shifflett, who was promoted to chief in 2011, is also a graduate of the Southern Police Institute’s Administrative Officers Course and the FBI National Academy. He said his experience, education and an outstanding group of officers has enabled the department to meet challenges head-on. One principal challenge the 22-person police department faces is the increased number of calls involving residents who need mental health assistance, Shifflett said. The police chief recalled an incident that highlighted the need for his department to have officers certified in crisis intervention. During the process, Russellville officers interviewed the man who indicated he wanted to live this way. In these situations, officers have to be sensitive to the person’s plight, Moore explained. “You don’t try to put them down,” Moore said. Moore added that the old methods of conducting a standard police interview and eventually hauling the person off to jail isn’t the answer. That also means when Moore answers a CIT call, the odds are that he could spend most of his shift handling it. Russellville Capt. 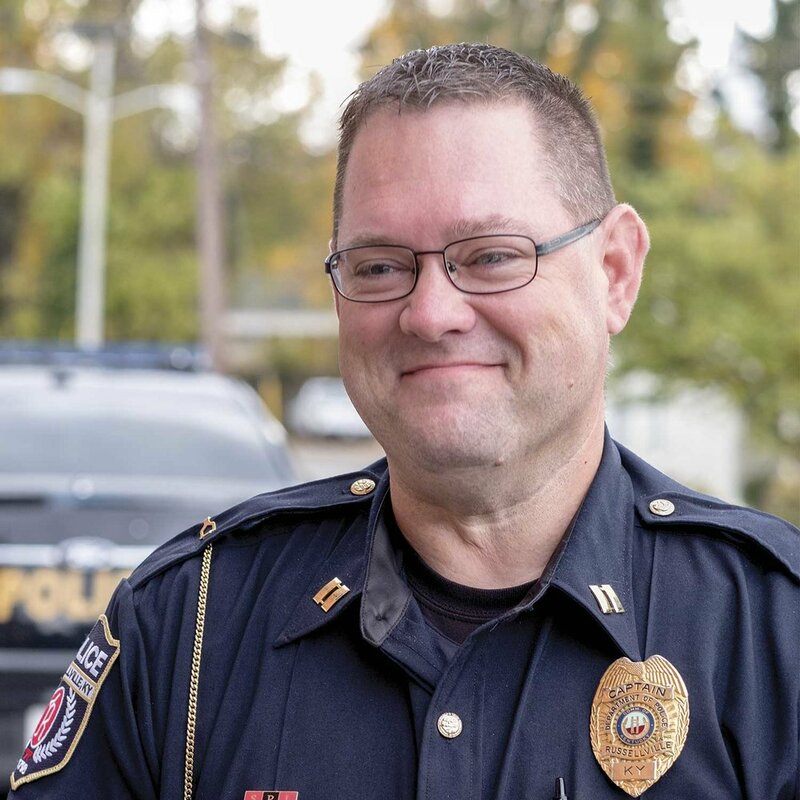 Todd Rayner said dealing with mental health-related calls is a fact of life, and the police department is reacting accordingly. Many of Russellville’s mental health-related cases can often be traced back to drug problems, Shifflett said. Russellville dedicates two officers to the South Central Kentucky Drug Task Force, which includes the Todd County Sheriff’s Office, Franklin Police Department and the Simpson County Sheriff’s Office. The police department also has a K-9 unit, as handler Chris Bellar is partnered with Jax. But even with dedicated manpower to the task force, Shifflett said it is an uphill battle. One key to successful policing is constant training, and that is something Shifflett takes seriously. In addition to Kentucky Law Enforcement Council-approved training, Shifflett seeks out other training for his officers. The police department’s yearly training also includes officers taking part in the annual Peace Officer Professional Standards fitness test. 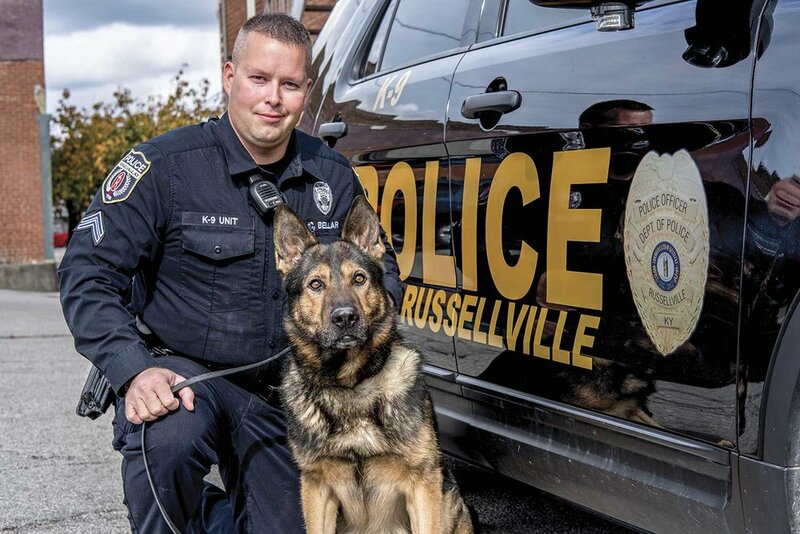 All of the training and comradery building helps the police department as it seeks to continuously improve service to the residents of Russellville, which is the crux of the agency’s mission, Shifflett added. The police department has several programs geared toward soliciting community involvement, including a nine-week Citizens’ Police Academy (CPA) and a week-long Teen Police Academy (TPA), which is held during the summer. Detective Sgt. Mary Lynn Smith oversees the TPA. She said it was born out of misinformation in the media. The teen academy is geared toward teenagers, ages 13 to 18, and it has quickly become a hit. Throughout the week, participants do everything from daily physical training to traffic stops. The CPA began several years ago, but community interest waned, and it went away for a few years. Three years ago, the police department revamped the program and marketed it through social media. It is similar to other CPA programs offered by agencies across the state in its primary goal to educate community members about how and why police officers do what they do. “It’s something we put a lot of time and effort into, and we create new ambassadors for us on the street,” Shifflett said. Modern-day Russellville is a far cry from the days when Jesse James raided the bank in 1868, and Shifflett credited the police officers under his watch for their efforts in keeping this western Kentucky community safe. “We have excellent people, and that is why we have a good department,” Shifflett said.